For years, I have been searching for the perfect binocular companion to my telescopes. A binocular which would be of a nice size to hand hold for wide-field sweeps of the night-sky, as well as for birds and wildlife and for long distance daytime views of mountain and ocean vistas. Almost all inexpensive binoculars that I have tested have had too many compromises in their performance for my personal needs. I was made aware of a small company that specializes in high-quality military binoculars, and had them send me a modified set (without the military reticle) to see if this would satisfy my particularly picky requirements. I was quite surprised and delighted that finally here was a binocular that did not cut any corners in their construction, quality of materials used, or in the design of the optics, at a price that was quite reasonable to boot. After having personally tested the performance of these binoculars on the night sky, I am convinced that they are just the ticket for the amateur who wants something better than the typical run-of-the-mill commodity binocular. To give you an idea of how well they work, I was able to easily see the stars of the Pleiades cluster before sunset while the sun was still above the horizon. The contrast was exceptional, showing all the members of this cluster as tiny pinpoints against a dark blue background. Cruising down the Milky Way under dark skies revealed countless stars, open clusters, globulars and other deep sky wonders. Even the faint members of the Leo Galaxy cluster show up nicely in both the 10.5x and 15x versions. These binoculars feature high-tech multi-coatings on all lens and prism surfaces for highest possible light transmission and image contrast. All optical surfaces are manufactured to a high level of polish and accuracy to insure sharp images under all observing conditions. The use of oversize prisms insures excellent light throughput to the edges of the field-of-view. All-metal construction makes these binoculars rugged and stable, yet the rubber-armored covering makes them comfortable in your hands. They will not lose collimation over time or with rough handling. They are nitrogen-purged and waterproof and will not fog over internally, nor will the coatings on the internal optical surfaces degrade with time under any conditions. We have shown these binoculars to various advanced amateurs who know good optics when they see them. Even the most knowledgeable and discriminating individuals were impressed by the sharpness and inherent brightness of these binoculars. They are fully equal to big-name premium brands sold at much higher prices. These binoculars are made to Astro-Physics’ specifications and performance requirements and we do a quality assurance check on each production lot. These 70mm binoculars come in two powers, 10.5x and 15x. The difference is simply that the eyepieces are of different powers. How to choose is the question. If your preference is to do more sweeping of the skies or daytime vistas while hand holding, we would recommend the 10.5x. The 15x binos definitely should be held on a tripod. The exit pupil on the 10.5x will be 6.7mm, while the 15x has a 4.7mm exit pupil. The smaller exit pupil of the 15x will be a better match for older eyes which do not open up to the larger diameter of the 10.5x version. The 15x power also will have a small advantage to the faintest magnitude star that can be seen. Eyeglass wearers note: both binoculars have fold down rubber eye cups and can be used with glasses. 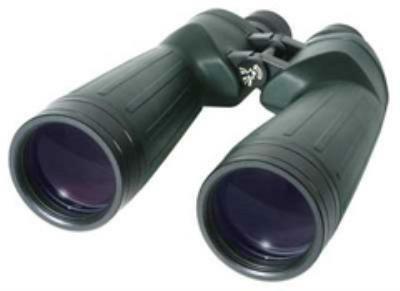 Click the button below to add the Astro-Physics 15x70 Premium Astronomical Binoculars to your wish list.